Arizona Gunslinger Hot Sauce is a delicious sauce that brings a unique flavor to anything you desire. It has a medium spice level, so nothing too hot or overwhelming, but it definitely has a kick. The sauce has a dark red color and thin watery consistency. It has a surprisingly delicious taste with the perfect amount of heat. The heat comes from the Jalapeño Peppers, which are my absolute favorite. The sauce has only natural ingredients, each add just the right pinch of balance. All in all, it’s a delicious sauce with lots of flavor that leaves your mouth wanting more. This sauce is dark red with a thin runny texture. Be sure to shake well before use. It has a strong, but delicious, jalapeño scent. Arizona Gunslinger Hot Sauce has a slight spice to it, so I would describe the heat level as medium. It has Jalapeño Peppers that give it the spice, but like I said, it’s really more of a medium spice level rather than a super-hot sauce. This is a very delicious sauce with a hint of spice. It’s a sauce that has a very well rounded taste with a great depth of flavor, surprising with only three ingredients. I splashed it on my chicken burrito and it added the perfect amount of flavor. I think it could really go good with anything. 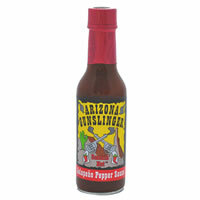 Arizona Gunslinger Hot Sauce has all natural ingredients- Red Ripened Jalapeño Peppers, Salt, and Vinegar. This mix of ingredients really rounds out the taste. I was surprised by the depth of flavor because of such few ingredients. When I added Arizona Gunslinger Hot Sauce to cooked chicken and allowed it to cook a bit, the sauce developed a well-rounded depth of flavor. Surprisingly, after cooking the sauce on the chicken, the spice actually became stronger. I was able to really taste the Jalapeño Peppers. Although the sauce became hotter, it still wasn’t overwhelming or too hot. The 5 oz bottle costs $6. That’s a reasonable price considering how delicious it is. They have a 100% customer satisfaction guaranteed return policy. 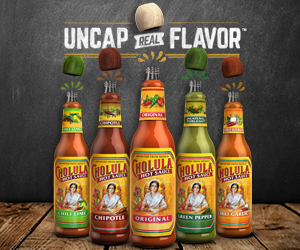 Cooked Taste Strong flavor, more spicy, balanced flavor…mmm!